As war looms in Europe, a group of travellers gathers at a hotel in Bavaria. While they are waiting for their train, American Amanda Kelly drinks a bit too much and does an impersonation of Hitler, which does not go down well with the Nazi stormtroopers looking on. A scuffle breaks out, during which Amanda receives a hefty blow on the head. Later, aboard the train and feeling somewhat the worse for wear, she has breakfast with Miss Froy, a cheerful British nanny, and the two become friends. Then, after she has slept off her ‘illness’, Amanda tries to find Miss Froy again. 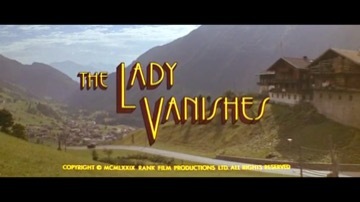 But, now it seems that she has vanished and, even worse, her fellow passengers insist that the lady never existed! Remaking any classic film is dangerous, but remaking Hitchcock can be regarded as verging on the suicidal and, although Rank had some success the previous year with “The Thirty-Nine Steps”, “The Lady Vanishes” was a disaster, mauled by the critics and ignored by the paying public. It spelt the end of the road for Michael Carreras and very nearly for Hammer as well, which would have gone under had Roy Skeggs not returned to rescue the Company from oblivion. From now on, though, there would be no more feature films and the ‘new’ Hammer concentrated on works for television, notably the series “Hammer House of Horror” and “Hammer House of Mystery and Suspense”. Fortunately for us, however, a fine legacy of their many classics remains. Elliott Gould’s films include “The Night they Raided Minsky’s” (1968), “Bob & Carol & Ted & Alice” (1969), “M*A*S*H” (1970), “Capricorn One” (1977), “The Naked Face” (1984) and “The Player” (1992). Cybill Shepherd later starred in her popular comedy show “Cybill”. Angela Lansbury’s films include “The Picture of Dorian Gray” (1945, for which she was Oscar-nominated), “Samson and Delilah” (1949), “The Court Jester” (1956), “Blue Hawaii” (1961), “Bedknobs and Broomsticks” (1971) and “Death on the Nile” (1978). In recent years, she has concentrated on her role as Jessica Fletcher in the long-running series “Murder, She Wrote”. Ian Carmichael is one of Britain’s most popular comedy actors. His films include “Private’s Progress” (1956), “Brothers in Law” (1956), “Lucky Jim” (1957), “I’m All Right, Jack” (1959), “School for Scoundrels” (1960) “Heavens Above!” (1963), “The Magnificent Seven Deadly Sins” (1971) and Amicus’s “From Beyond the Grave” (1973).